Why Air Conditioner Size Matters - T.Webber Plumbing, Heating, Air & Electric. Whether you are thinking about investing in an air conditioner for the first time or you are ready to replace your existing system, there are several factors to consider. While it is important to pay attention to brands, prices and energy ratings, one of the most important factors is the size. When purchasing an air conditioner, there are several sizes to choose from, and selecting the right size makes a huge difference. Most people realize that purchasing an air conditioner that is too small is a bad idea. An AC that isn’t large enough is forced to run non-stop to cool a home. In addition to driving up your electric bill, it could fail to cool your home to the desired temperature. What many homeowners don’t realize is that an oversized AC is just as bad. You may think that buying an oversized system is a good way to cool your home faster, and that’s true. However, the system will cycle on and off more frequently, causing unnecessary wear and tear. This could cause the unit to break down prematurely and for force you to end up spending more on repairs and maintenance. There are numerous factors to consider when determining what size AC you need. The most important factor, however, is the square footage of the area you want to cool. It’s also important to consider room configuration, what type of and how much insulation you have and your climate. Your best bet is to have an HVAC technician come to evaluate your home and recommend the correct sized unit. 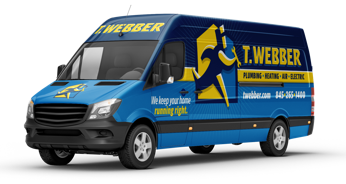 At T.Webber, our highly skilled HVAC technicians are experts when it comes to helping homeowners choose the right size air conditioner. Whether you are buying an air conditioner for the first time or upgrading from an older model, we’ll help you choose the size that best suits your home.